This post is sponsored by Krylon® Brand. All ideas and opinions are my own, as always. Hey friends! I’m excited to share my gym organizer with you today! I LOVE organizing and exercising so this gym organizer was so fun to make! 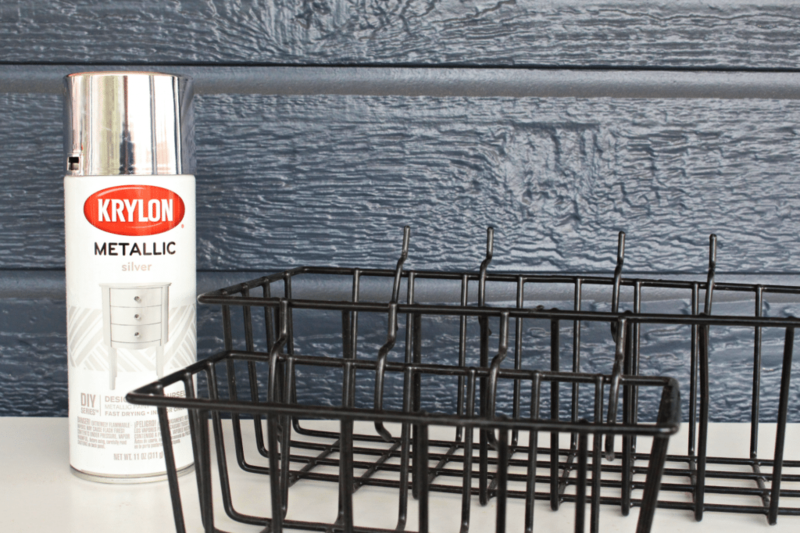 It took about 3 hours total (including drying time for the paint) to make this gym organizer. several 1-1.5″ wood screws – I used 1.5″ wood screws that I had on hand. 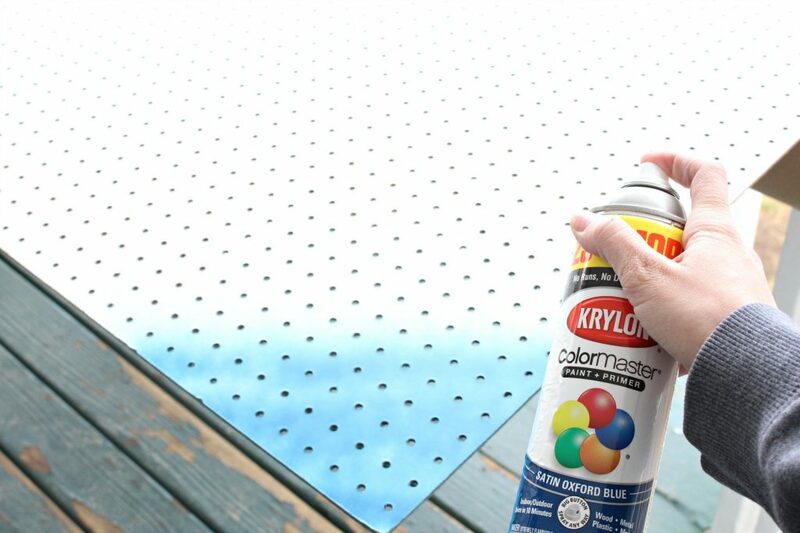 In a well ventilated area, spray paint the pegboard with Krylon ColorMaster Paint + Primer – 25% More in Satin Oxford Blue. Make sure to read the label for safety and application instructions. 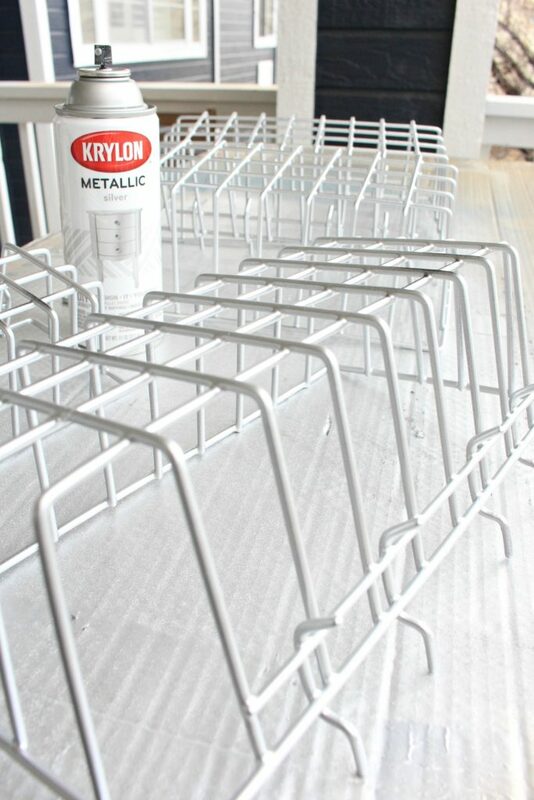 I did 3 coats, allowing each coat to dry thoroughly in between coats. This took about 2.5 cans of spray paint. 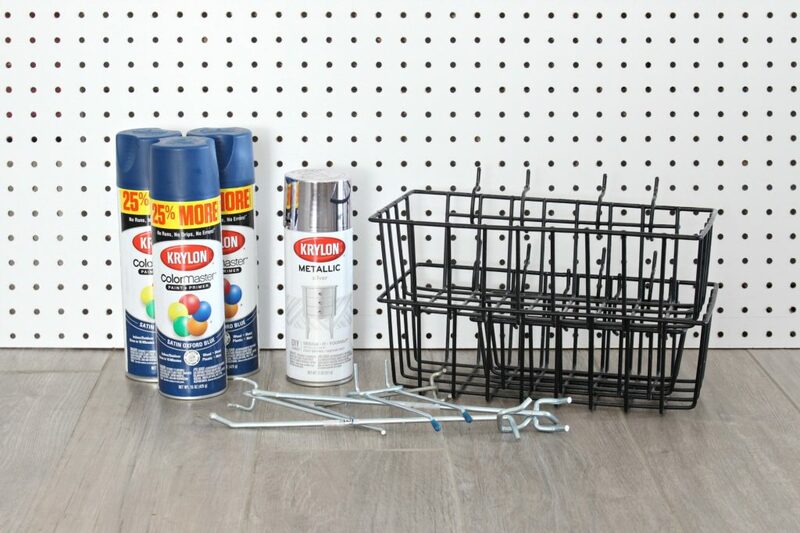 While the pegboard was drying, I did 2 coats of Krylon General Purpose Metallic in Silver Metallic to spray paint the pegboard accessories. Allow to dry. This took 1 can of spray paint. Using Krylon General Purpose Metallic in Silver Metallic I sprayed a large poster frame that I used to decorate the pegboard. I did two coats and it took about 1/2 a can of paint. 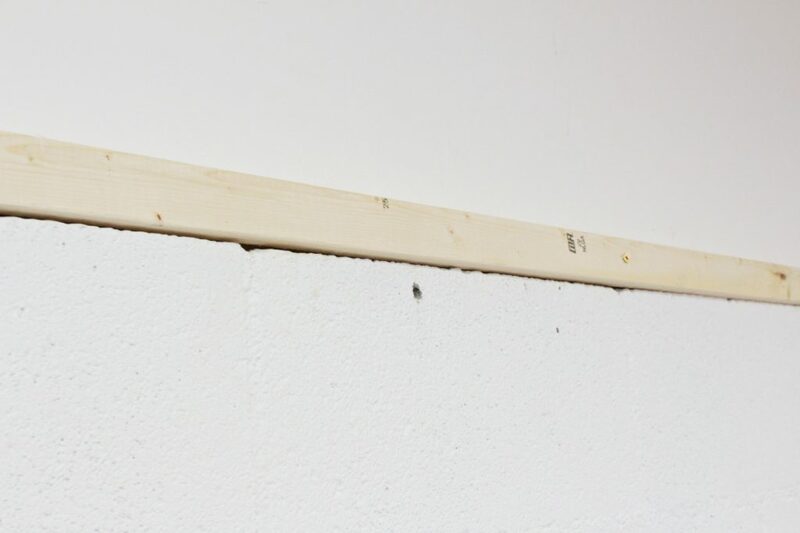 Then, I mounted my 1×2″ boards to the wall in our home gym to create a frame to mount the peg board on. 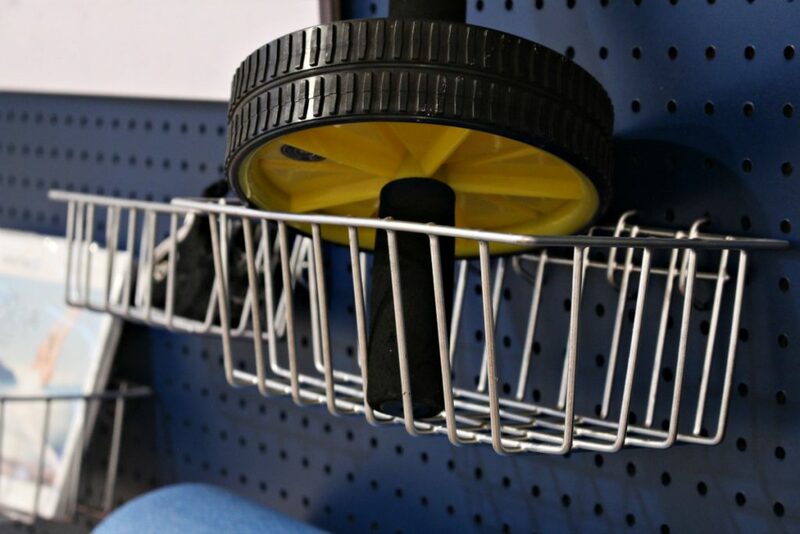 This allows space between the wall and the pegboard so you can get your hooks in the holes easily. 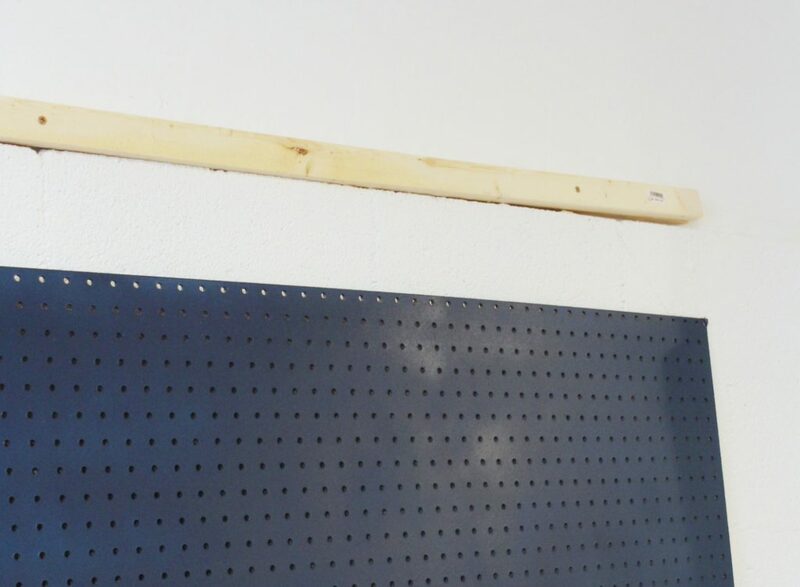 I attached the pegboard to the frame with wood screws. 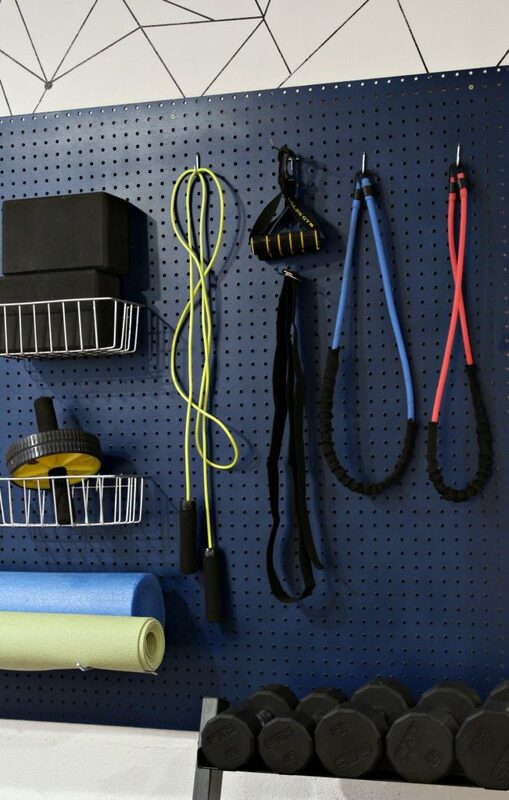 Finally, I hung all of my hooks and baskets on the pegboard and organized all of my extra gym equipment, including my ab roller, jump rope, bands, weight lifting gloves, yoga DVDs, yoga mat, foam roller, fascia roller, etc. 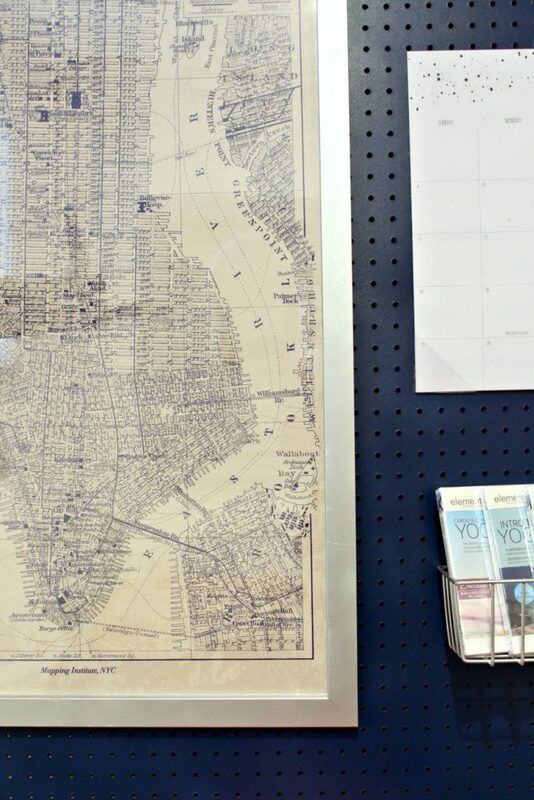 Since I didn’t need all 8 feet of space on the pegboard, I hung a cute NYC map in the poster frame that I spray painted. 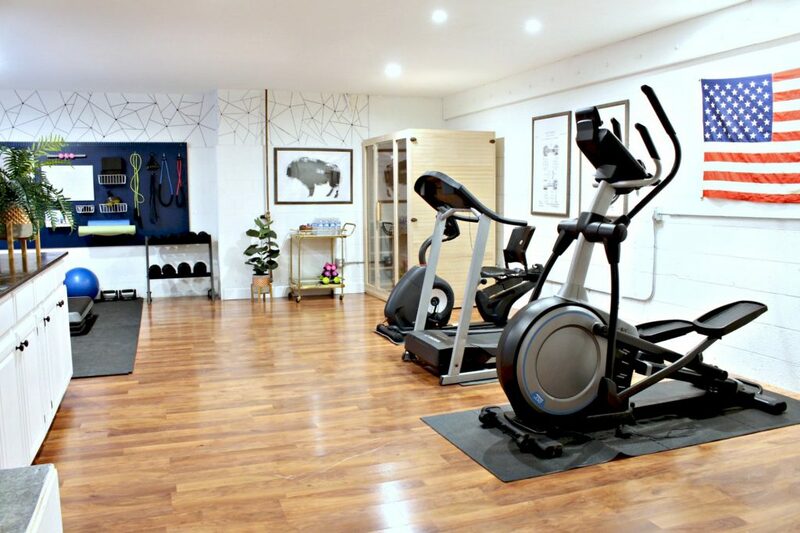 I am always acquiring new gym equipment and accessories so when the time comes that I need more space, I will remove the poster and add more hooks and baskets. I love that it adds some personality to the gym organizer. It is so functional and so cute! I love how it turned out! 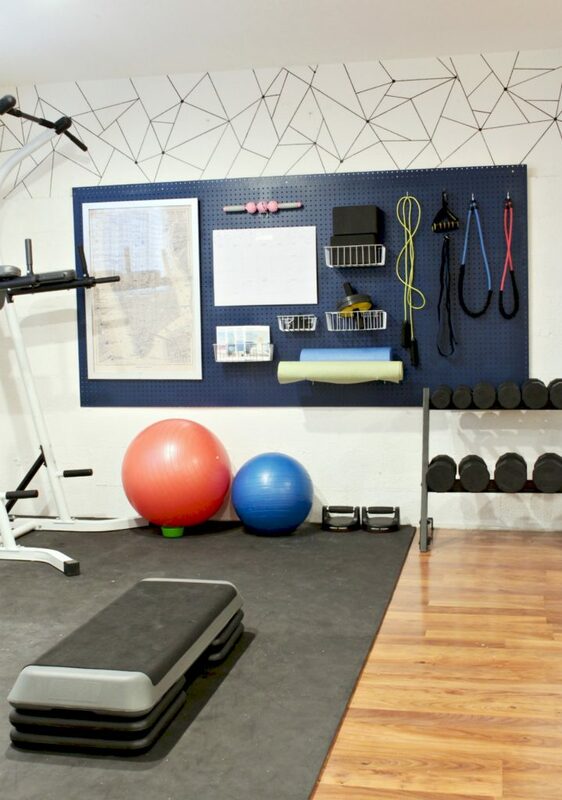 Be sure and check out my gym makeover and if you have any questions about the gym organizer, let me know! 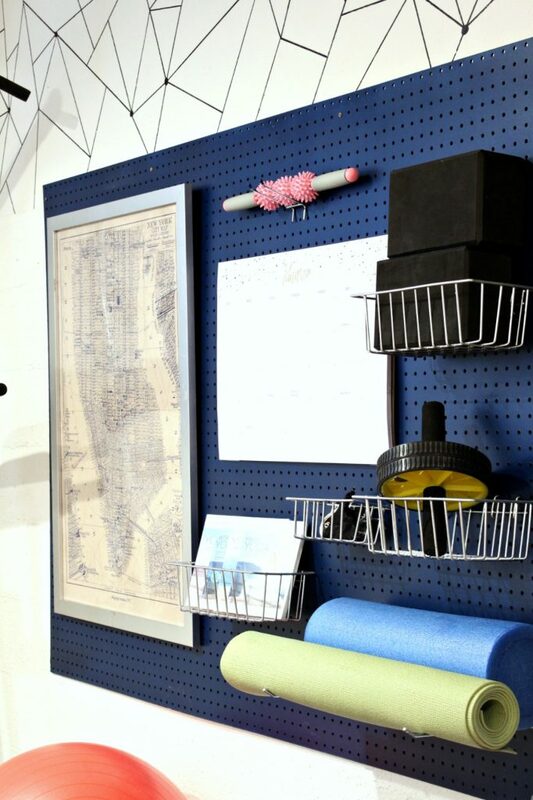 Hi, I love the pegboard. 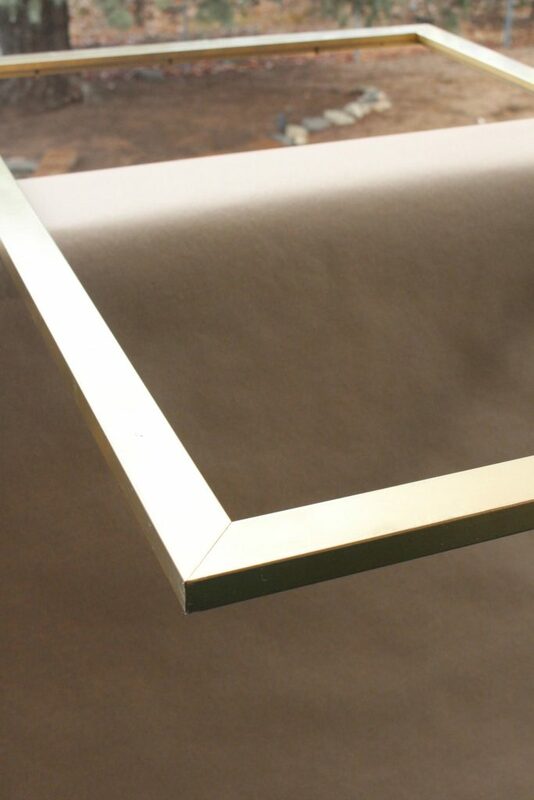 Did you frame the whole board and nail the pegboard onto the border on all sides. I see the nails at the top but is it also on the sides and bottom too? You should normally. I didn’t because the top is drywall/sheetrock and the bottom 2/3 of the wall is cinderblock. Hi! 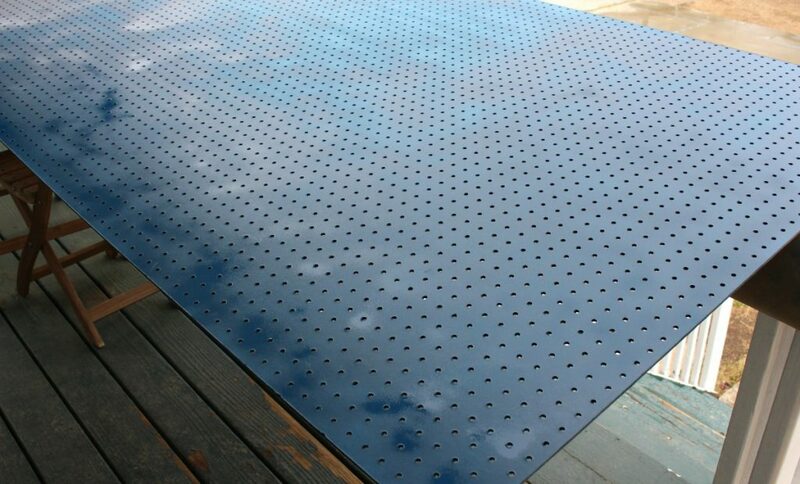 Where do you buy a pegboard that large? Its 4×8′ from Home Depot.